Substantial savings in CPF agent bank charges. If you are currently investing through a non-IA platform, each fund house whose funds you purchased will individually and separately request monies from your agent bank. This means each fund that you buy will individually incur CPF agent bank charges. These charges can rack up to a significant amount. More importantly, these charges erode your returns. As an IA, iFAST is able to draw a consolidated amount directly from your agent banks for all your investments. On iFAST, you are charged the lowest fee no matter how many funds you buy. 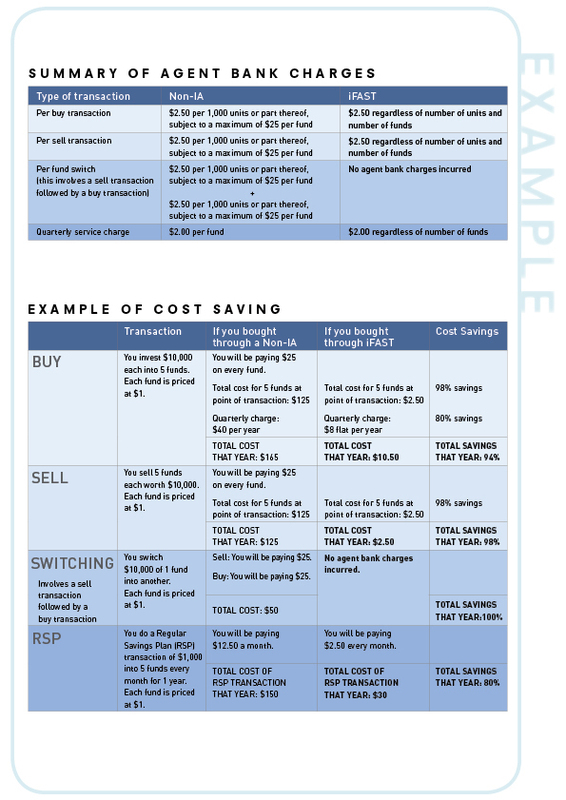 The table and example below illustrate how much you can potentially save by investing through the iGP platform. When you invest through a non-IA platform, you will receive product statements from several parties including the agent bank, fund house and fund distributor. By investing through the iGP platform, the only statement you receive will be a consolidated one from iFAST. The completion time for CPF transactions is cut by 50% by transacting through iGP.